PLEASE READ "WHAT IS MoTIS " BEFORE YOU VIEW OUR AIRCRAFT- THANK YOU KINDLY! 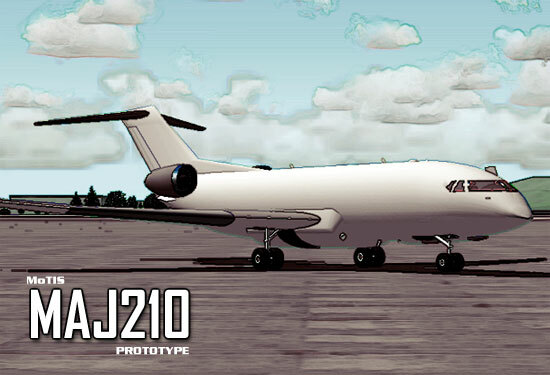 The MAJ210 is the answer to a smaller midrange commercial transport airliner for the next generation of flight. While the aircraft is still in the prototype development phase, the J210 as she is called for short is a dynamic all glass cockpit designed neo concept aircraft that is the design accomplishment of team MoTIS developers. The Senior design and development engineer on this project was Jennifer Guess and she has come up with some very unique virtual technology to go along with this development project. © MoTIS 2002, 2003,2004 ,2005, 2006, 2007, 2008, 2009 by MoTIS INDUSTRIES. All rights reserved.